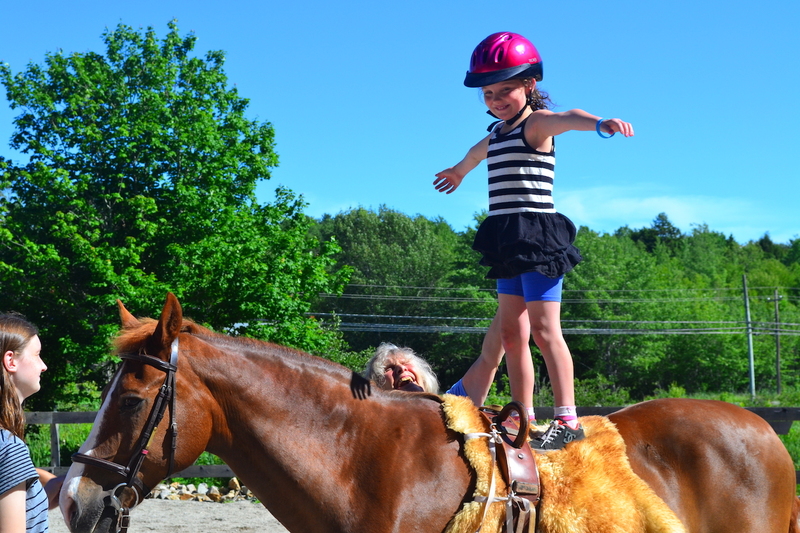 On the weekend of July 6, 2018, Hinchinbrook Farm held its third annual Summer Sensory Camp. The camp was sponsored by generous donations for our summer programs (including Horse Boy Playdates and the Sensory Camp) from The Province of Nova Scotia, The Municipality of the District of Lunenburg (MODL), The Royal Bank of Canada (RBC), The Gordon Foundation for Children and Youth and United Way of Lunenburg County. Therefore, we were able to offer the camp at absolutely no cost to participants, including healthy meals and snacks, and we included two fireside chats with a Movement Method specialist as well as a 2-day workshop on the Movement Method for parents and volunteers. For more on the Movement Method, check out this page>>. The camp had 4 families sleeping over for the weekend while another 4 families attended the programs during the day. The total number of children thus served was 15, and they were supported by 22 volunteers (⅔ of our volunteer group) who worked 352 hours, 2 summer student staff (thanks Cicely and Brianne) and our Program Director, Patty McGill. We were also supported by the Movement Method instructor, Bianca Rumbach (who was an integral part of the camp) and her daughter, Catarina. Over the course of the 3 days, 127 meals were served and snacks kept everyone hydrated and energized. Before the weekend, we brought in Jonathan Wentzell with his equipment to create two flat and gravelled campsites. These proved to be a wise decision as the downpour on Friday afternoon would have washed out normal campsites, but these just drained away leaving dry sleeping areas. The Sensory Camp provided an extended vision of our regular Horse Boy Playdates, with trail riding, ring riding, games on horseback, zip lining, swimming, fishing, playing in the hayloft, a homemade Pokemon game, trampoline and many other games to keep everyone busy, active and challenged at all times. There were also quiet times and family time around the picnic tables. We are grateful for our hard-working animals, too. Our therapeutic horses were central to the success of the camp, but other critters, such as Kelly the Newfoundland therapy dog, Pippy and Dexter the ‘guard-cats’, Thumper the dwarf rabbit and the two goats were also put to work adding enjoyment to the kids’ experiences. Following the camp weekend, Bianca led a two-day Movement Method workshop that was attended by 11 volunteers, 5 parents and 2 local teachers who paid a small fee to join the group. The local community is working on a similar program in two grade 5 classes, using a system developed in Scandinavia so we hope that this extra training will be useful to the pilot program.